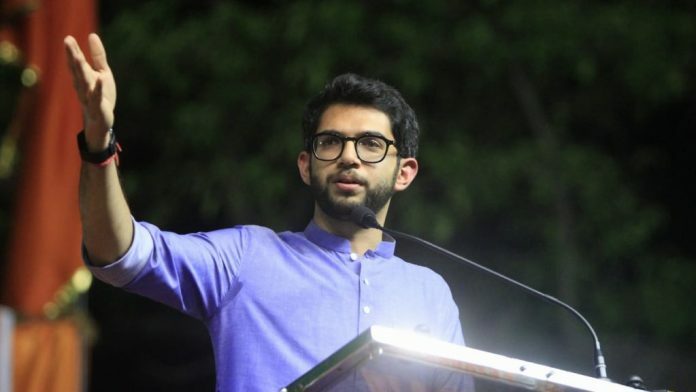 Aaditya Thackeray, the 28-year-old son of Uddhav, is the new Shiv Sena neta — busy addressing rallies, holding Q&A sessions and talking about more than youth & education. The face on the screen is not of Sena founder Bal Thackeray, who had earned the monicker of ‘tiger’ due to his rabble-rousing firebrand speeches. It’s also not of his son, Uddhav Thackeray, who has taken over the leadership of the party and slowly imbibed the aggressive oratory of his father. On the screen, the face is of the dynasty scion, 28-year-old Aaditya Thackeray, greeting people and addressing rallies. This election, the Shiv Sena has pushed the youngest Thackeray in politics to campaign just as prominently as his father, if not more. The Yuva Sena president has a busy schedule, addressing rallies for the party’s candidates across Maharashtra, having special Q&A sessions titled ‘Aditya Samvad’ with youngsters in different parts of the state, accompanying prominent candidates to file their nominations, as well as visiting micro pockets of Mumbai’s constituencies for personal interaction with voters. Anil Parab, a Shiv Sena leader and member of legislative council, said the party’s campaign strategy this time is such that while Uddhav Thackeray addresses the big rallies across the state, his son takes care of the ground-level roadshows, ‘padyatras’, personal interactions with voters and so on. “It is helping us make the most of our two star campaigners and cover all the 48 Maharashtra constituencies in the four phases of elections,” he said. Aaditya, an arts and law graduate, has already addressed about 10 rallies this season, campaigning for individual Sena candidates as well as through his ‘Aditya Samvad’ events. In his political rallies, he explains how the Shiv Sena opposed the government despite being a part of it only to ensure that decisions are in public interests. He talks about how today’s Bharatiya Janata Party (BJP)-Shiv Sena alliance reminds him of the kind of partnership the two parties shared when Sena founder Bal Thackeray, and BJP’s Pramod Mahajan and Gopinath Munde steered the alliance. He often takes digs at the Nationalist Congress Party (NCP), slamming the “Rashtrawadi Congress” as the “bhrashtawadi Congress”. Addressing farmers, Aaditya talks about how the Shiv Sena fought for the Land Acquisition Act to be in the favour of the people. He tells them that he has extensively toured drought-affected areas over the last five years to understand farmers’ problems. “I do not understand agriculture. I am not a farmer. I am a shehari babu (a city man). But I understand that the Shiv Sena can address farmers issues… There is no rain but the ground is getting moist due to the tears of our farmers,” he said in his address in Marathwada’s Parbhani district last week. “Earlier, Aaditya’s connect was limited to young voters and issues related to education, but over the past two years he has extensively travelled across Maharashtra, understood various issues of the state and can voice his perspective on these in a very matured manner,” said a Sena functionary who didn’t wish to be named. The party is reaching out to the youth in Maharashtra through ‘Aditya Samvad,’ an event in which the Yuva Sena leader picks questions at random from a huge pot of questions sent in by youngsters. He answers these live in front of a huge crowd. So far, the Shiv Sena has organised these events at Kolhapur, Nashik and Aurangabad with two more expected at Maval, from where Sharad Pawar’s grand nephew Parth Pawar is contesting, and Mumbai. The questions range from job creation in tier 2 and tier 3 cities to why the Sena is different from other parties to lack of sporting facilities in rural areas, to his opinion on having a separate prime minister for Jammu and Kashmir. Answering a question on why the Shiv Sena has women cadre in large numbers at one such event in Kolhapur, Aaditya said, “People may call me a feminist, but I think it is important to raise women’s issues and give them a voice. “Even when we organise football matches in schools in Mumbai, we ensure gender equality. There are equal numbers of boys and girls in a team,” he said. Manisha Kayande, one of Shiv Sena’s spokespersons, said, Aaditya’s polite, quiet talk and a modern approach helps the traditional parties connect with voters across all classes and demographies. “He has a vision and has steered the plastic ban in Maharashtra, called for eateries and cafes to stay open 24/7, raises his voice on issues of education, fitness, self-defence for women, football,” she said. “He is not very loud in whatever he does. People are liking that,” added Kayande.